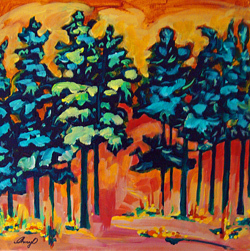 Art Courses with Cheryl O – less scary than skydiving, and the fun lasts longer. “Although I am a beginner, Cheryl’s approach to teaching made it easy for me to learn. I very much appreciated her encouragement” Eleanor B. “I feel like a new way of looking at art and the world around me was inspired by your classes. 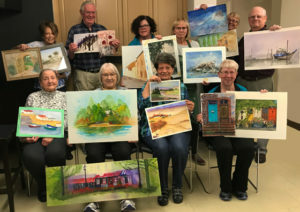 I also loved connecting with kindred spirits.” Kelly M.
“This course allowed me to add dimension and depth to my paintings!” Irene K.
“You make everyone feel very good about their work, and if we ask for help you are right there.” Christa I. “Having different levels of ability in the classroom is great … It never ceases to amaze me what I learn from everyone around me. It has gotten me back in my studio and feeling the creative juices flowing again.” Gayle Y. “The teaching and classmate encouragement were great motivators to help achieve artistic goals, all in an enjoyable atmosphere.” Paul U. “I loved this course. I felt that it unlocked my creativity in such a fun way. 10 weeks and 10 paintings that I am proud of!” Joan K.
“This particular course helped me suppress my tendency to ‘over-detail’ my work.” Fiona S.
“For the first time ever I painted clouds that looked alive. Wonderful new techniques, Cheryl.” Donna F.
“Always a pleasure and lots of fun.” Harry Q. “I’ve never seen improvement in my art work like this before, and I’m not alone in this thought.” Rosalie A. “You are an amazing teacher!” Lucy Q. “PS- I have gone skydiving and it is exhilarating. What I gained from this last course was even more so for me!” Donna F.
“Your emails are like opening a lovely surprise each time!” Angela B.